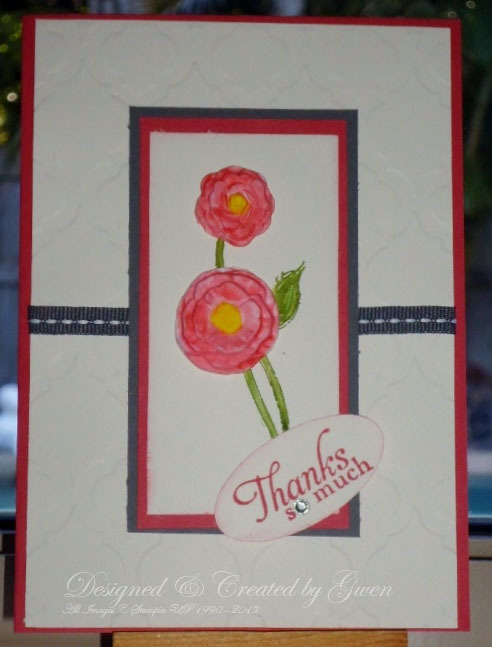 After having a good play with the Simply Pressed Clay and the Buttons and Blossoms Mold, I thought that I would quickly put a card together using a couple of the flowers that I had made. Using my Aqua Painter I picked up some ink from the Primrose Petals Ink Pad and painted the two flowers, the centres I painted with Daffodil Delight using the same technique. I coloured the stems and the leaf from the Simply Sketched stamp set using my Stamp n Write Markers and Old Olive and a touch of Gumball Green. The card base is Primrose Petals and that was topped with Very Vanilla which I had run through the Big Shot using the Modern Mosaic embossing folder. The main image was stamped on Very Vanilla and matted on Primrose Petals and Basic Grey. I love the new stitched 1/4" Grosgrain ribbon and used the Basic Grey around the centre of the card. The focal layers were placed using dimensionals, the sentiment was stamped in Primrose Petals and I placed a Basic Rhinestone in the 'O' of the so. 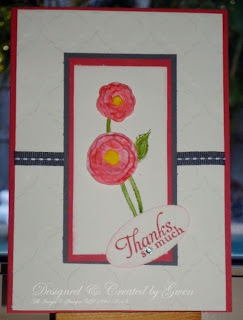 The flowers were attached using Tombow adhesive for its strength. Absolutely gorgeous Gwen. The simply pressed flowers look beautiful and make a fabulous focal point. Thanks Kris, I think they are going to be a lot of fun. Hi gorgeous woman..... thanks for the mail.... I simply love your work. Hope the family members are keeping well and out of trouble. David and family have moved house from their beachy suburb of Christchurch to a leafy, eastern suburb of Christchurch. Disappointing for me :( but they are only a 3 hour flight away. Little Miss Pia, on the other hand has made big decisions for her future. Pia has found her 'dream bloke' and yep he is not Australian.... though he has lived in Queensland for the last 3 years. Cupid's arrow has hit home and Boo is selling up and moving lock, stock and barrel to the US to live. Flying time .....G.O.K!